Well, chickadees, we've reached the final installment of our look at Arab-American masculinity. It's been a heck of a ride, hasn't it? So far we've looked at a whole host of issues involved in properly representing Arab-American men in pop culture. From the issue of cultural assimilation in Community to Arab-excellence in Star Trek: Deep Space Nine to the intersection of race and mental health in Mr. Robot to the realities of growing up Arab in post-9/11 America in Green Lantern - there's a lot to talk about and oh have we talked about it. After all that heaviness, it might seem kind of frivolous to go out on this note, looking at a silly little show with a silly little premise that barely anyone ever watched. But I think it's worth examining this topic, looking at the history of "genies" in American pop culture and how they intersect with Arab-American masculinity, particularly because of one simple fact: we rarely think of genies as being inherently Arab characters. Okay, so this is going to go a little deep today, but before we go super far, let's start with an introduction to this whole concept. Let's talk about Once Upon a Time in Wonderland, an attempt at spinning off the inexplicably popular Once Upon a Time franchise. OUATIW had the same basic "feel" as its predecessor, but followed a more linear narrative. Alice (Sophie Lowe) is a nice young lady living in Victorian England. She's also a teensy bit mad, or so everyone thinks. Having returned from Wonderland, Alice is very sad and almost willing to let the doctors treat her and make her "sane". Fortunately for all of us, though, Wonderland still needs her help! 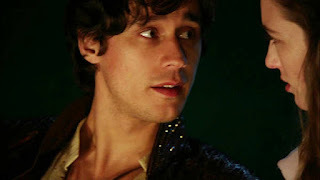 The Knave of Hearts (Michael Socha) and White Rabbit (John Lithgow) rescue Alice from the asylum and give her some wonderful news: the love of her life, Cyrus (Peter Gadiot), might not be as dead as she thought! Galvanized by the desire to reunite with her one true love, Alice springs off into a super fun adventure to save Wonderland from Jafar (Naveen Andrews) and the Red Queen (Emma Rigby). It's all good fun and games and honestly I probably wouldn't have much negative to say about this show if it weren't for a sort of weird plot point. See, Cyrus isn't just the love of Alice's life. He's also a genie. For some reason. I say "for some reason" because there isn't a whole lot of good reason for Cyrus to be a genie. On the one hand, it does drive the conflict and give Jafar and the Red Queen a good motivation for trying to get their hands on him (and possibly have him killed), but on the other hand it reduces this male character to a basic MacGuffin. He's the bottle being tossed around all the time and Cyrus himself has very little say in his own fate. Even weirder, the actor playing Cyrus is not actually Arab-American or even vaguely Middle-Eastern. He's Hispanic, which is better than a fully white actor playing the role I guess, but it's still a strange choice. In fact, Cyrus as a character is only vaguely Arab, despite being, you know, a genie. And that's what I want to focus on most here. 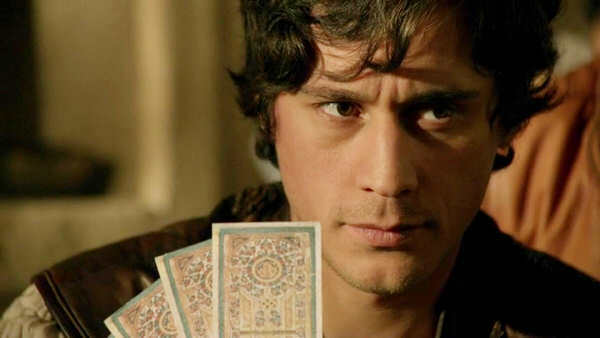 For all that Cyrus is actually a pretty interesting and cool character, there's something very odd and unsettling in his appearance in this show being divorced from any actual Arab culture or folklore. Instead, his existence as a "genie" is presented as being the sort of bland and universal magical background kind of thing that just exists in the Once Upon a Time universe. While it's nice to see that white fairy tale tropes aren't the only ones to have made it through, there's something of cultural appropriation here when we consider the complete whitewashing of even the idea of a genie. Okay. So for most of us, the word genie brings up memories of Robin Williams speed-shouting in Aladdin - a magical blue guy who grants wishes. Only three wishes, of course, and there are always caveats and quirks. Sort of like the fae in most European folklore, the general presentation of genies is as slightly more "exotic" or "ethnic" versions of this, magical beings who can grant wishes and don't really exist outside of our own perception. Or maybe we think of Barbara Eden wearing harem pants and winking a lot in I Dream of Jeannie, a show that we might dismiss as sexist drivel these days, except for it being literally the only mainstream American show to feature an Arab-American woman as the main character. Jeannie might be a California blonde, but she's also stated in the text as being originally from Baghdad, so it counts. Well, that's a subject for a book, quite frankly, but the basic gist is this: we simplified it way the hell down and then appropriated the entire concept. There is a story in 1001 Arabian Nights where the young Aladdin is aided by a powerful Jinni. The Jinni doesn't grant him wishes exactly, but somewhere along the line that's what it turned into. And also somewhere in there the Jinni became bound to a bottle, forced by arbitrary rules to be enslaved by his own power. It's hard to think of a more literal defanging of a cultural concept. From magical beings of immense power and complete free will to wish-granting slaves who live in shackles - the transition from Jinn to genie seems to be directly reflective of who is telling the story. In other words, Western culture didn't like Jinn but they were comfortable with genies. And so genies are what we have now. Again, this is mostly conjecture. But it's worth looking at because this transition, this shift from a fully Arab mythical being to a denuded, Westernized wish-granting slave, makes it easier to think of "genies" as generic magical beings without any particular cultural background. In other words, Jinn are Arab. Genies are whatever you want them to be. And so you get a character like Cyrus, who is very old and very "mystical", "exotic", and "magical", but only vaguely Arab. He's a genie, not a Jinn. He's an example of how Western, particularly American, culture has taken a piece of folklore and appropriated it. Which is either brilliant or awful depending on your perspective. Now it's worth pointing out that I don't think Cyrus is a bad character in and of himself. I actually think he's rather lovely. He's this powerful magical being who happens to love a rather wonderful woman and he is devoted to her. Their relationship is the core of the show, a pairing that remained untarnished by even suspicions of emotional infidelity. 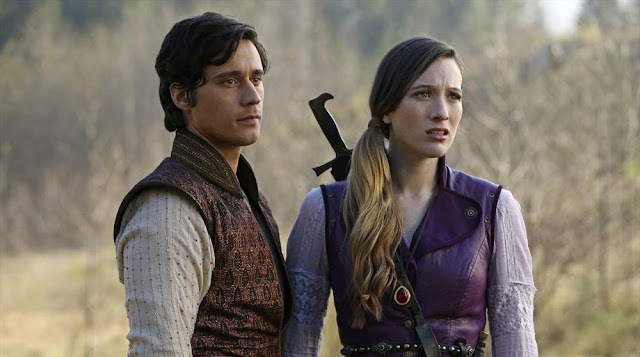 While most of Once Upon a Time uses romance for angst angst and more angst, Once Upon a Time in Wonderland actually let us get comfortable with Cyrus and Alice's true love. Sure, there were always obstacles in their way, but we never doubted their feelings. 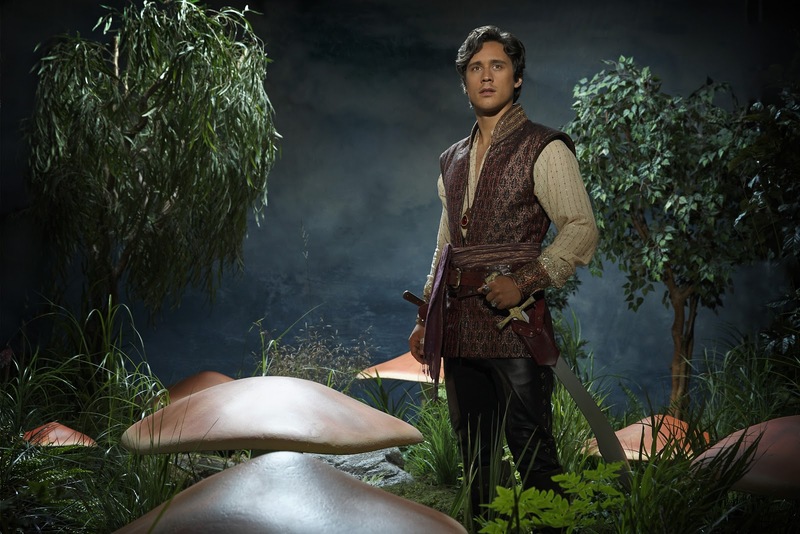 Cyrus is presented as being very clever, talented with a sword, kind-hearted, and generally a good person all around. He's very old and very wise and at the same time still a young man with passions and desires. He's a pretty cool character, is what I'm getting at. Not perfect, but certainly better than usual. If he were allowed to actually be an Arab character, if his role as a genie were in any way tied to actual Arab cultural history, if he were even played by an Arab-American actor, I might feel comfortable hailing this as a fantastic example of Arab-American masculinity in pop culture. But none of those things are true, so I'm not. Instead, I want to point to Cyrus and his role as the hardest kind of representation to define: absence. Cyrus represents, more than anything else, the lack of representation available for Arab-American men. If Arab-American men can't even see themselves in mythical beings based on their own folklore, where is our hope here? So much of what we've talked about in Arab-American Heritage Month on here has been how Arab-American masculinity is forced to either declare itself loudly and risk being demonized or else hide and assimilate and pray no one notices it. This is just one more example of the latter, a case where the inherent Arab-ness of a character was seemingly too much for the show or the network to handle in anything more than broad strokes. We have to face up to this lack, this dearth of good characters where the roles we would normally see as Arab-American have been Westernized past all recognition, and go from here. Cyrus is a great guy, but he could have been more. He could have been an example of how to tell Arab stories well. Instead, he's a somewhat forgettable love interest from a show no one watched about a story that doesn't really have any roots in anything at all. They are super cute though. *I am by no means an expert in the Qu'ran, Arab oral traditions, or the other information you see here. I just did some research, so if this is wrong, I blame the internet. Interestingly, Aladdin was Chinese in some of the versions of the original story. It was mainly done to make the story more exotic since there wasn't a lot of research done into the setting like no true Chinese names and using the term, sultan instead of emperor. So it could be argued that the original book was appropriating Chinese culture (since Arabs are the dominant culture from where the story was written). Also, "granting wishes" was essentially "doing favours," and the Djinn who did that tended to play straight. (If they wanted to do you harm, they'd just do it).